The Saudi-led coalition launched heavy air strikes on Yemen’s main port city of Hodeidah on Friday, in an apparent resumption of military operations on the city after the Iranian-aligned Houthi movement attacked two Saudi oil tankers, residents said. The coalition on July 1 halted an attack on the Houthi-held city to aid UN efforts at a political solution that would avert an all-out assault on the Red Sea port, which the United Nations fears could trigger a famine throughout the country. Residents said coalition warplanes had begun their bombardment after midnight, attacking a Houthi military police camp in the city centre, a plastics factory north of the city, and the districts of Zubaid and al-Tahita to the south. The Houthi’s al-Masirah TV said on Twitter that the coalition hit a radio station in the city and a fishing pier. “Coalition warplanes conducted two strikes on a fishing dock and market in Hodeidah, and the yard of the Hodeidah radio building which was damaged by the shrapnel,” one resident said. Saudi Arabia said on Thursday that it was suspending oil shipments through the Red Sea’s Bab al-Mandeb strait until maritime transit through the waterway is safe, following an attack on two Saudi oil tankers on Wednesday. The Western-backed alliance of Sunni Muslim Arab states intervened in Yemen’s war in 2015 to restore the internationally recognized government of President Abd-Rabbu Mansour Hadi, ousted from the capital Sanaa by the Houthis. Coalition forces quickly retook the southern city of Aden and smaller coastal towns, but since then neither side has made much progress in the war, widely seen as a proxy conflict between Saudi Arabia and Iran. 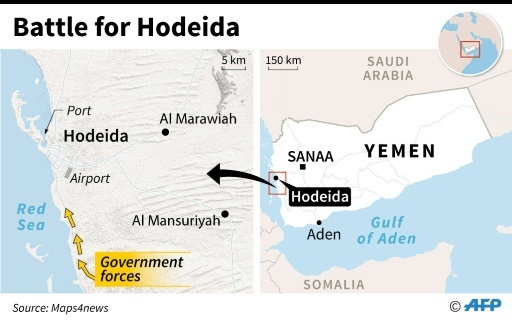 The alliance says capturing Hodeidah would cut off the main supply line of the Houthis and force the group to the negotiating table, but it has made no major gains since it launched the offensive on 12 June. UN special envoy to Yemen, Martin Griffiths, on Friday left Sanaa after another round of talks with the Houthis as part of weeks of shuttle diplomacy between the warring parties. The United Nations fears that cutting off Hodeidah port, a lifeline for millions, may trigger a famine in Yemen where around 8.4 million people are believed to be facing starvation. The Houthis have offered to hand over management of the port to the world body, according to the United Nations, but the coalition says that the group must quit the western coast.